Rach and I were supposed to hang out on Saturday. I didn’t wake up until 11 and then went to IHOP with the fam and Jacob, and then I called Rach to warn her that I was sick in case she didn’t want to hang out with me. Dawne heard this and said, “Oh good. I’m glad you told her. I saw you at lunch today and was so happy I wasn’t sitting next to you.” Rach and I wrapped presents, watched 2 minutes of Holiday Inn, shopped, wrapped some more, had Erika’s Hot Heaven, and snuggled in to watch Elf. Good day. Rachel: Why are their faces all black? Zach (seeing the cartoon depiction of a black family in 1974): That is so offensive. Rach: They might as well be in Black Face. Rach: Zach? Is that what we’re doing here? We watched Prep and Landing and now I’m going to try to use “That is so Tinsel!” at least once a day until Saturday. Zach: We should get Egg Nog! Me: There is Silk Egg Nog in here. Zach (after drinking): The Silk Egg Nog ruins it. Zach: It tastes like cyanide. Lillia (Russian lady giving me a pedicure): You single? You need to move back to NY. The men here? No good. Me: Well what about… ? Lillia: NO! They are not for you. Very strange. Go back to NY then you can bring them here. Listen to me. I know what’s best for you. We then walked in our flip flops (I mentioned we were classy right?) over to Rock Bottom Brewery. There we had lunch, cocktails and for the slightly sick, Hot Toddies. Me: I don’t remember these being this good when I was 12. Shana’s mom: Sometimes I tell Shana I’m going to ship her father to her and I may or may not put holes in the box. Dawne to Rach, about Rach & Christmakah: We could all really feel that there was just something missing. Me: Oh right! Because Mariana wasn’t there! Momela: Wait. Did you just say you had hot toddies and THEN you went to the gun range?! Rach: Mimosas, hot toddies... I see what she was saying but their waiver was QUITE DE-tailed... and not ONCE did they mention alcohol! 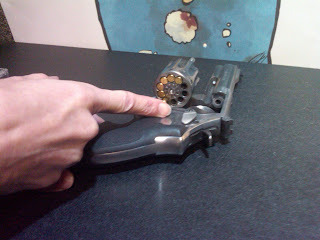 We then went over to Wade’s Gun Range and Rental because on Sunday’s there is a Ladies special. Free gun rentals and ½ price lane fees. We each chose our targets (there were various zombies including zombie clowns, Bin Ladin, and of course your standard outline targets.) The shooting area was quite cold, but I quickly learned that they do that on purpose because the adrenaline warms you up quite quickly. We shot a .22 caliber Revolver (“These look like they are from the movies!”), Rifles and a gun that had a laser on it (I don’t know what it was called) and then a 9 mm (that I actually shook after the first time it fired until I could calm down, settle and get back on target) and then a .45 that was uber powerful and after 6 shots I was done. But then George said “But you have one more shot!” Oh do I George? Then I guess I have to shoot it don’t I? Becky and I bought our own protective eye and ear gear and then Becky bedazzled, because we like to take it to the next level. And yes, I do think we shamed all good standing republican women that were there outside of our group. Rach: Neck shot. Nice. That’s gonna be a bleeder. George (from Wade’s): I have never seen a group of ladies with better grips. Shana’s mom as Rach walked away to switch guns: There is nothing hotter than a woman packin’ heat. Cathy: That’s it. From now on all of our events need to have two opposite events in them. Me: I love a good challenge. Becky: I was thinking next time Sky High (the trampoline gym). Me: And then CAVING! Wait. Was that what Cathy meant? My brother, Sean: You are crazy. Seriously. Crazy. Me: Crazy? Or crazy AWESOME? Sean: Well, you sure are memorable. Oh! Last week we also had a “Team Building” meeting where I finally learned who was on my team, and what their names were. I always end up being tagged as a “Promoter”. Becky was an influencer whose profile mentioned clearly that she was also a manipulator. I personally thought it was a strategic misstep for the team to tell the manipulators all of our faults and personality habits—but hey, I’m not running this ship. At one point, we had to do one of those exercises where people are broken into groups and you have pieces of tubes to use together to get marbles, ping pong balls and golf balls from one side of the room to another. As soon as I heard that it wasn’t a competition I was all for working together—but my team’s yellow tubes weren’t as big so we got kicked off the main chain. Later, in the post-mortem, people were analyzing the types of people who wanted to be in the beginning middle and end of chain and what that meant as personality type. And then one guy raised his hand and said “Well then what does that say about Tiffany who was in the beginning of the chain and then ran around to finish the chain?” Look! People know my name now! After the meeting, we were going to go over to the bar for drinks. I was worried about leaving 45 minutes before anyone else, but Becky assured me that she had told the VP I had to help her. Oooookeedokee. We also had the family Christmakah, but I was so sick and sleepy I don’t remember much. I do remember giving Zach and Nate their annual subscription to NetFlix. Except when Nate opened his he said, “This proves it. You really do love Zach more—you only gave me 5 months!” I told him that I gave the extra month to more deserving people… like the homeless who don’t even have TV’s.